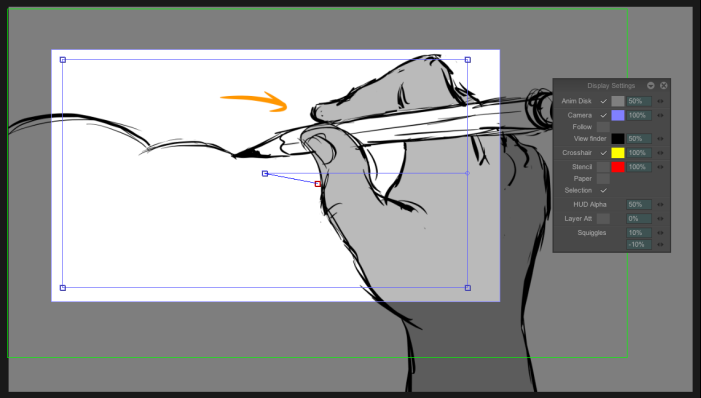 First of all, go to File > New Project to create the project which will contain your storyboard. The panel just below will appear (you have already seen lesson 01). This time, we will care about the Project with Camera tab. • Ratio represents the enlargement percentage between Camera View and Drawing Area. When an animation movie is made, camera moves are usually used (zoom, travellings, etc ... ). Those camera moves needs a larger working space to add them later. For this example, we propose you to select the format HDTV 720 x 200%.To know more about the meaning of the other terms, (Frame rate, Aspect Ratio ...) please read the lesson 01. Then, click on New project to create your new project. By default, a grey veil (named View finder) will be displayed on your working space. This view finder helps you to see the final output view. For your visual confort, you have two ways to disable it : open the Display Settings panel (by going to the Windows > Display > Display settings main menu) you can either click on the Camera checkbox, or by decreasing the View finder slider to 0%.